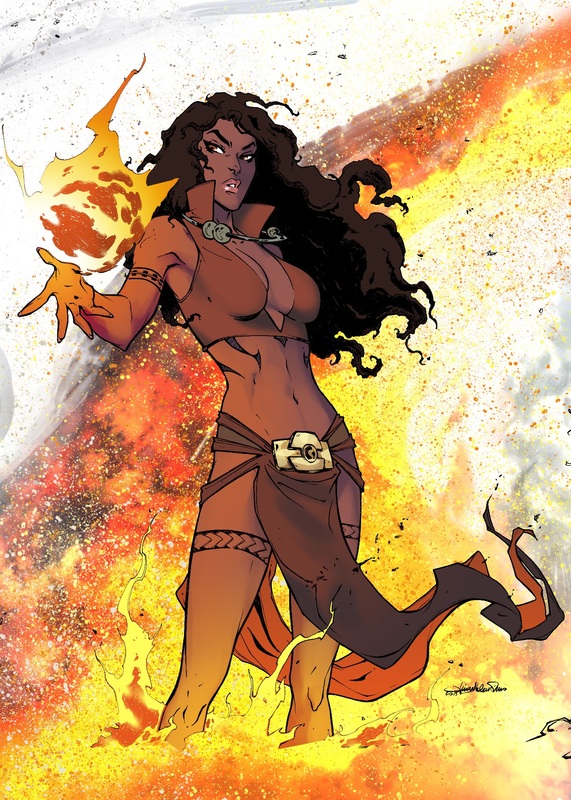 Powers: As a pyrokinetic she can generate intense heat and and is immune from their effects. At some point in the past she spontaneously developed the power of Pyrokinesis. Unknown to her at the time this was in response to the activation of the four Horsemen of the Apocalypse which were hell bent on the destruction of Earth. She was now the latest in a line of elements who would band together form an unbeatable force for good: Fire, Water, Earth and Air. Not knowing her true purpose she set about using her powers for an undisclosed time on an unidentified Island in the South Pacific Ocean. She was approached by the latest Earth Elemental, Gia Sorentino. Alongside Ivana Ghoul the Wind elemental they set out to find the water elemental Aspen Phillips the most powerful of them [The Four Points #1, 2015]. After recruiting Aspen Phillips they battled the undead and faced the god Ares. This ordeal convinced Aspen to join their cause full time until the world had been saved [The Four Points #3, 2015].